Serenity Healthcare is a division of a larger billion dollar health care provider. 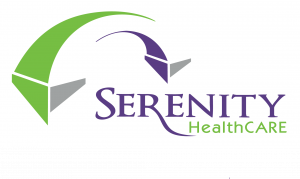 Serenity Healthcare offers specialized care to individuals suffering from Alzheimer’s disease and other forms of dementia. Serenity has developed scientifically based programs to help aging residents deal with these issues. Their goal is to build a bridge between perception and reality of the issues aging residents face. With more than five million people in America living with Alzheimer’s disease, the opportunities to raise awareness and debunk some myths surrounding care are vast. Serenity wanted to take their unique and proprietary care plan and simulation to a wider audience. They needed a new corporate identity that would reflect their cutting edge approach to this industry. Create a bridge graphic to create a jumping off point to tell their story. The colors are directly representative of the dementia scale of cognitive function and used throughout all of their marketing materials. Fonts needed to tie in with existing font selections to create a cohesive brand with other entities within the corporation. Providing a bridge to connect Alzheimer’s patients and their families with the truth about the disease.